Many brands are jumping into social media in order to engage their “community.” People talk about how many Twitter followers, or page views, or Facebook Likes they get, and how they are “managing” that community. But a crowd is not a community. Just because a brand has 20,000 Twitter followers, it does not mean they are connected to each other. That is the opportunity those 20,000 Twitter followers affords you – to become a leader, to enable these people to become connected. When you go to a shopping mall, do you look at the thousands of customers as a community? Nope, they all just ended up next to each other at the mall. If you go a level further, and go into The Gap. Are all the people in that single store a community? You could argue that there is a common thread that lead each person to that brand. That they are somehow connected by worldview, style, or a number of other factors. But they are strangers. They wouldn’t lend a fellow Gap customer $5. They have little interest in the goals and experience of those around them. They are just customers. And this is what many brands fail to understand about the people that they serve. They don’t feel connected with other customers. They don’t feel connected with you. If you are The Gap, they may simply be connected with a shirt that is on sale. So, they are connected with price, the color blue, and a button-down short sleeve style. Think branding is more powerful than that? Then why are Loehmanns and T.J. Maxx and Marshalls so popular – discount stores with a hodge-podge of brands. What this means is that a brand needs to understand the segments of their audience – and as they move online – this needs to transfer. All of your Twitter followers are not equal. They are merely an opportunity for you to understand and serve. Find out which members of your audience are willing to take action and engage with your brand. Offer them something and see who bites. Then, make those people smile. They are the ones most likely to praise you to their friends. Put 90% of your effort to the most important 10% of your audience. Quantity metrics, such as followers or page views – in aggregate – are not actionable. You can have 5 million Twitter followers and still go out of business. When measuring what coverts to business, combine metrics across platforms: social media to newsletters to events to websites to print. Bring together those who love what you do. This is not about them being loyal to you, but about you being loyal to them. It’s not about their belief in your brand, but their belief in a common idea that you help represent. Don’t just use social media to monitor how often your brand is mentioned – monitor the topic. Listen. Engage. Talk only when you are helping. Moving the crowd around a room is not leading, not inspiring, not serving. That is just moving things around, something that many managers spend too much time doing, in hopes that one of those round pegs fits into a round hole. Leading is harder, and takes much more subtlety. It takes more risk. It affords less credit to the leader. But it is wildly more powerful. People are fickle, especially when it comes to ‘brand loyalty.’ That’s why you have to serve deeper needs, not just surface level momentary preferences. Scared that your community will flip on you, just as everyone left MySpace for Facebook? A crowd does that, a community doesn’t. 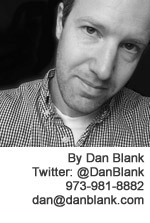 Let me know if I can help you in building your community: @DanBlank, 973-981-8882 or dan@danblank.com.